I saw two movies recently. One was a very nice, well done movie. The other was not as good. I'll tell you about each of them. I'd like to thank my wonderful grandmother for spending a small fortune to take me, my mom, and my two brothers to see "How to Train your Dragon" in 3D. T'was a fun little trip. If you watch TV or shop at Wal Mart, you've probably heard of "How to Train your Dragon". It might be Dreamwork's most massively advertised movie ever... Anyway, the basic plot of the movie is that a young Viking, named Hiccup, finds a dragon, whom he names Toothless, and tries to train it to be his pet. The only problem is that the Vikings have always been at war with the dragons and they only know how to treat them as enemies. The dragons steal their cattle and burn down their villages. Why should they treat them as friends? Hiccup has to train Toothless in secret. Eventually, thanks to Hiccup, the vikings learn that it's better to be friends with the dragons and that working together is a better solution than fighting. The movie is based very, very loosely on a book of the same name. Okay, really the only comparisions you can draw between the movie and the book are the titles and the names of the main characters. And that it's about vikings and dragons. In the book, Hiccup's dragon Toothless is a tiny dragon about the size of a large cat. In the movie, Toothless is a sort of super dragon. Fast, intimidating, powerful...oh well. 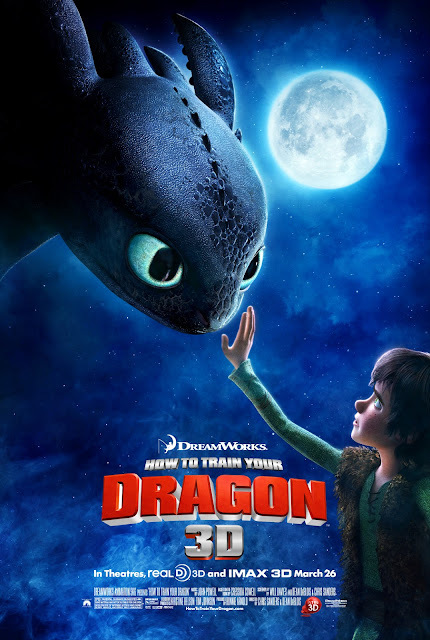 If the dragon of the movie had been a literal Toothless, the whole message of the movie would have been "Believe in yourself. Little guys can do big things". Which is a good moral, but it's been used in more than 10 other movies in the past 5 years. So, fans of the book can't go to the movie an expect a literal adaptation of the novel. Another difference between the book and the film is that the book was really funny. The movie is not. The script sounds like it took about a week to write. There are about 3 or 4 good jokes in the movie. But I don't think that it's supposed to be a funny movie, so you can't be let down by there not being any funny bits. One great thing about How to Train your Dragon is that it is surprisingly very well animated. The fight scenes with the dragons are very impressive. Although the different species of dragons are cartoony looking, they are intimidating in action. And cute when Hiccup is soothing them. So is it worth paying to see in theatres? I say wait for the DVD. Some critics are saying, "The 3D is amazing!! It's like an "Avatar" for the whole family." How to Train your Dragon is not like a family-friendly Avatar. I saw Avatar. It was a sci-fi masterpiece, more than 12 years in the making. This little piece of Dreamworks junk probably took 7 or 8 months to piece together. The animation is very well-done (although definitely not Avatar quality) and the story is fairly decent. But it's not really a "big screen" movie. If you want to see it in theatres, I don't think 3D is the best way to go. It costs more, and this is not a real 3D movie like Avatar. 2012 update: I'm bumping up my former B to a B+, just because the team at Dreamworks decided to break from tradition and tell an animated story about doing exactly that, breaking from tradition and reanalyzing your worldview. As far as I know, no animated movie prior to this had a similar message. In a generation that's populated with silly melodramas about Believing In Yourself, HTTYD is a breath of fresh air. 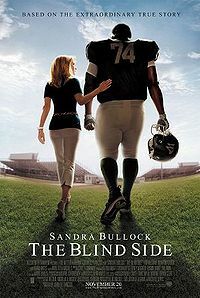 The next movie was "The Blind Side". I'm going to be brief with my review of this one, because doubtless you've already heard of it, and you know of all the rave reviews it received and you don't feel like reading another long review that praises it in the same way more or less.